(Born: 3/19/1926) - Elaine is a sparkling, vivacious, motivational public speaker, known and loved by thousands for her warmth, and spontaneity, and personal inspiration to others toward a greater joy of living. Even at 90 her appearances are vital, dynamic and life changing to people of all ages. She stimulates, motivates and educates! Since her early days as a television pioneer, and host in 1948, Elaine has lit up screens all over America. She was also an integral part of her husband Jack LaLanne’s television programs, speaking, and other public engagements. At 91 she still hasn’t slowed down and can still do full body push ups. Her years of experience combined with her contemporary business savvy provide an exclusive insight into Jack Lalanne as she answers everyones questions about her husband. Her presentations even include footage of some of his superhuman feats of strength! 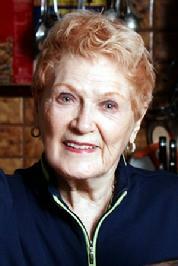 Elaine LaLanne, she looks young, she acts young, and inspires her audience to be young at any age! With infectious excitement, she paints a picture of the “YOU” that you want to be.